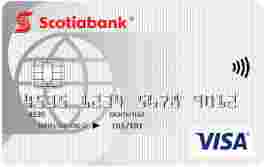 Scotiabank Value Visa Card is typically available to those with good credit scores (650 or greater). It may not have the lowest rates when compared to other low interest, balance transfer credit cards, but it’s pretty close. If you’re looking to reduce your debt, then this card will help you with that. The Scotiabank Value Visa is an excellent choice for Canadians looking for a low-interest credit card that extends that low interest rate to cash advances and balance transfers. Or $0.00 if account is part of a Scotia Total Equity Plan. Although the Scotiabank Value Visa has an annual fee, there’s a lot to like about the card. The 0.99% promotional interest rate is comparable to the other cards, but what makes this card interesting is the fact that the you pay a flat interest rate of 11.99%. Since the rates are straightforward, there’s no confusion about how much interest you’ll pay. The Value Visa Card by Scotiabank is a good option for those looking to do a balance transfer, but who also want a more versatile card for use beyond the balance transfer itself. Some may not be able to see past the $29 annual fee, but this can easily be made up for if the cardholder rents cars from Avis.